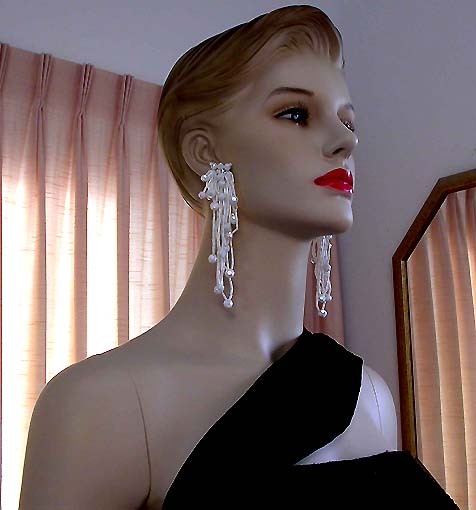 VINTAGE COSTUME BRIDAL JEWELRY BRIDAL DANGLE DROP EARRINGS! White Glass Bugle Bead Vintage Bridal Long Dangle Drop Clip Earrings For Weddings, Proms, Pageants And Parties! Item #BD168315 - White Glass Bugle Bead Vintage Bridal Long Dangle Drop Clip Earrings. 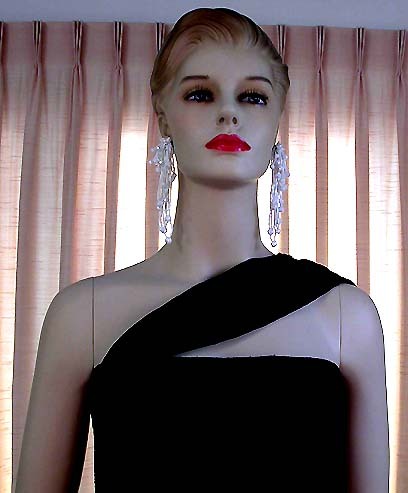 Aren't these vintage drop earrings absolutely stunning?! They are strung with glistening iridescent white glass bugle beads into long loops of various lengths. Each beautiful long loop has an iridescent white faceted lucite crystal round bead accenting the tip. The iridescent coating adds additional glitters to the piece. The gorgeous multi loopy strands overlapping one another voluminously and cascade like a magnificent shimmering waterfall. Ravishing! Clip backs. Excellent condition. Fabulous earrings for weddings, proms, pageants, cruises, parties and special functions! SOLD TO MISS NEW YORK 2006 FOR THE MISS AMERICA 2007 PAGEANT!